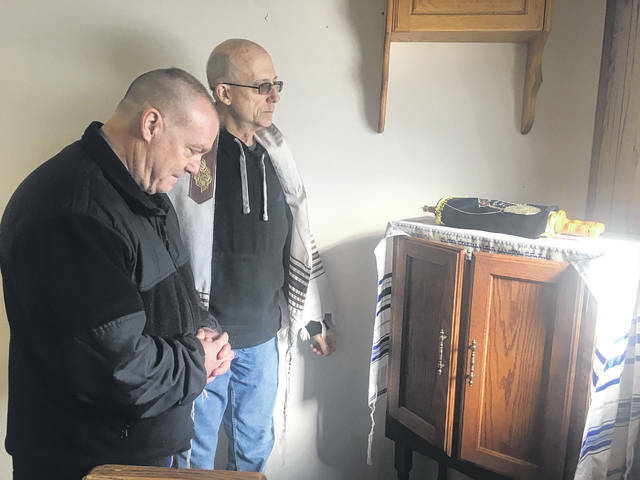 Bruce Campbell and Jim Richardson pray over the Torah scrolls housed at 417 Linden Ave. The scrolls were later walked to 121 W. Poplar St. to allow it to be set as the new home for their studies. 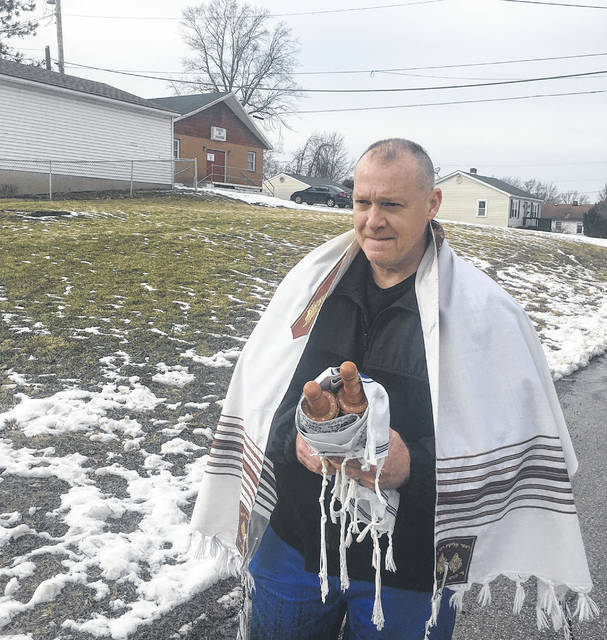 Jim Richardson from the Messianic Jewish group in Sidney walks the Torah scrolls from 417 Linden Ave. to 121 W. Poplar St., effectively establishing a new place of study for the group. SIDNEY — A local group of Messianic Jews recently walked their Torah scrolls from 417 Linden Ave. to 121 W. Poplar St. to establish a new place of teaching. The new home of the scrolls is in the community room at Canal Place Apartments. It’s a tradition that the Torah scrolls be housed at the place where the studies are taking place and that they be walked there. The first leader was Ray Barnett. Barnett was a former member of the German Baptist faith. He was a minister for a nondenominational Church before he founded the Messianic Jews. “After Ray died, some people went their own way. We couldn’t afford the rent on the previous building, but RJ (Horowitz) presented us with a new place to keep meeting. We let the other place go back to the owners,” said Bruce Campbell, leader of studies. Horowitz is property manager for LFR Ohio Properties. Barnett died on Feb. 8 from pnuemonia. He led the group in Sidney for 10 years. His widow, Sandy, offers a free lunch at Canal Place each Thursday in memory of Barnett. She and the people following Barnett’s legacy have also devoted space for a food pantry. Since Barnett’s passing, the group has dwindled to nine people who meet devotedly and study the Torah. “The Torah is more than just the first five books of the Bible. We study what others call the New Testament, too. We believe that Jesus studied the Torah and is the walking embodiment of it. The New Testament shows us how to live righteously,” said Campbell. The group does not study the traditional versions of the Bible. They consider the versions translated directly from the Hebrew or Aramaic to be more accurate. “What Ray did was radical. What we do is not readily accepted by the church,” said Campbell. The group espouses the New Testament as being informed by the Old. “It’s all about Ray’s legacy. I’m just honored to pick up the mantle his place. Ray was genuine,” said Campbell. Meetings are held each Saturday noon to 3 p.m.